Nov. 13, 2018 – When it comes to diversity of markets for logs, it’s good news for Canadian loggers, and even better news the further east you go. 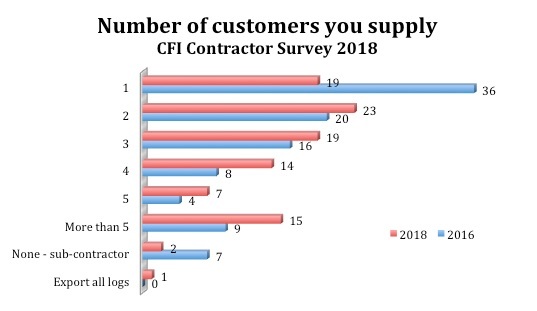 Results from CFI’s 2018 Contractor Survey show a jump in the number of contractors who are able to supply to multiple mills compared to data two years ago, as reported in our 2016 Contractor Survey. In 2016 more than a third of contractors said they supply to just one mill. This year those supplying to a single mill dropped to just 19 per cent. On the other end of the scale, the percentage of loggers supplying to more than five mills increased to 15 per cent in 2018 from just 9 per cent two years ago. Percentage of contractors reporting customer numbers for timber or other products. When viewed regionally, the competition for fibre varies, with eastern loggers having more customers than their western counterparts. 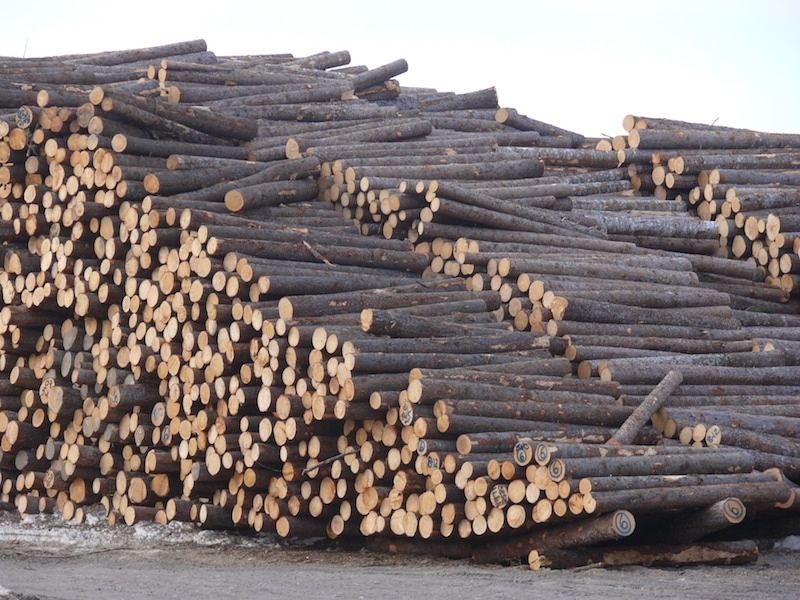 Loggers in Atlantic Canada seem to have the most options when it comes to mills vying for their fibre – 42 per cent of contractors there have at least five customers for their logs or other wood products such as biomass or pulp chips. This is not entirely surprising given the number of smaller, family-owned operations operating on a relatively small land-base compared to other regions in Canada. 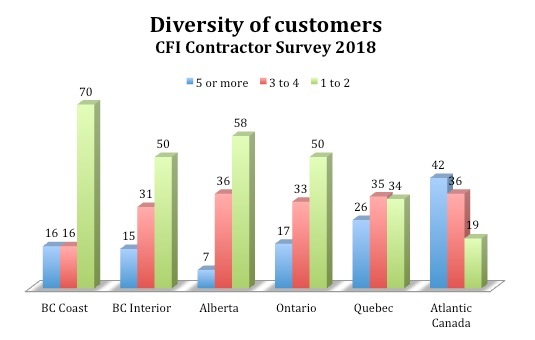 As you head further east the percentage of contractors with five or more customers drops lower, bottoming out in Alberta at just 7 per cent. Alberta also has the second highest percentage of loggers supplying to one or two customers. Ontario and the B.C. Interior have similar percentages in all categories, with 50 per cent of loggers in those regions supplying to one or two customers, around a third supplying to three or four, while 17 per cent or less deal with five or more customers. Contractors on the B.C. Coast appear to deal with the fewest mills, with 70 per cent of respondents there claiming to supply one or two mills. Breaking that number down: 31 per cent supply to just one mill, and another 39 per cent deal with two mills. Percentage of contractors reporting customer numbers, by region.